The return of a legend - and the end of an era! 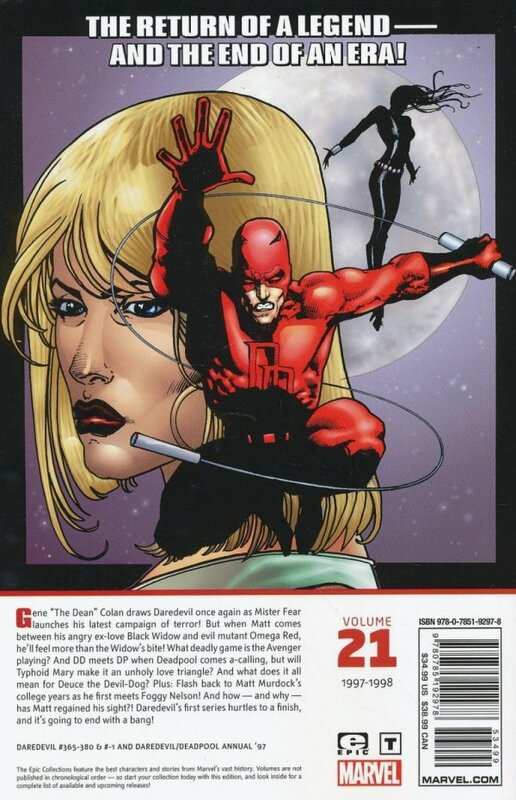 Gene "The Dean" Colan draws Daredevil once again as Mister Fear launches his latest campaign of terror! But when Matt comes between his angry ex-love Black Widow and evil mutant Omega Red, he’ll feel more than the Widow’s bite! What deadly game is the Avenger playing? And DD meets DP when Deadpool comes a-calling, but will Typhoid Mary make it an unholy love triangle? And what does it all mean for Deuce the Devil-Dog? Plus: Flash back to Matt Murdock’s college years as he first meets Foggy Nelson! And how - and why - has Matt regained his sight?! Daredevil’s first series hurtles to a finish, and it’s going to end with a bang! Collecting DAREDEVIL (1964) #365-380 and #-1, and DAREDEVIL/DEADPOOL ANNUAL ’97.